Plan up to a year’s worth of newsletters! 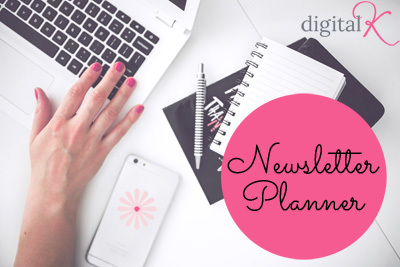 Use my Newsletter Planner to send out your first (or next!) email newsletter, provide outstanding value to your subscribers, and give readers a reason to look forward to your emails! To do this, you’ll need to be intentional with your efforts. You will need to remain consistent – not only with your timing (email on the same day at the same time each and every week), but also with your content. This Guidebook walks you through everything from getting clarity on who your audience is and how you serve them, setting up your newsletter for the first time, tracking your promotions, and planning your newsletter content. Who are your Readers? Describe your ideal customer or client. Worksheet: WHO Am I Writing My Newsletter To? Why YOUR Newsletter? Think about why someone would want to SIGN UP for your newsletter – and why they would want to STAY on your list after they have signed up. Worksheet: Why Would People Want to be on MY List? The Know, Like and Trust Factor: Figure out exactly what makes you special and unique. Worksheet: Why ME? – How Do Readers Know Me, Why Do They Like Me and Trust Me? Your Bio: It’s time to create a compelling bio. Create Your Mailing Schedule: Create a schedule that works for your audience. Content Planning and Your Promotional Calendar: Plan what your promotions will be for the month and then plan your content around what’s going on in your business. Where to Find Ideas: Keeping Track of Your Favorite Newsletter Inspirations. You will LOVE having this weekly planner that you can print off and use in your business!